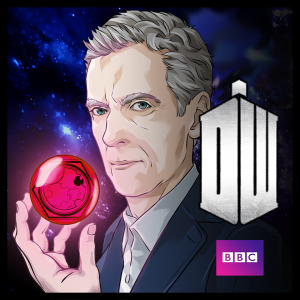 December 2, 2014 Tiny Rebel Games, Seed Studio and BBC Worldwide are proud to announce that Doctor Who: Legacy, the award winning free to play mobile game, which has already surpassed one million installs, is celebrating its one-year anniversary. In celebration of the anniversary, Doctor Who: Legacy will be releasing free daily content with brand new levels, characters, and costumes as part of their second annual Advent Calendar promotion. The team is also pleased to announce that Kylie Minogue as Astrid, and Frank Skinner as Perkins will be joining the game, as well as extended universe characters and content from all of the Titan Comics’ Doctor Who comic book series, extended universe content from the Big Finish audio series, and also Cinder from the War Doctor novel, Engines of War. Since its launch, Doctor Who: Legacy has added all of the canon Doctors from the television series, more than doubled the amount of playable content to over 60 hours, and recently completed a first ever-weekly tie-in of episodes to coincide with Season 8 of Doctor Who. Widely lauded as one of the best examples of free to play mobile gaming, Doctor Who: Legacy is also one of the few mobile games to add constant on-going story driven content, which is created in in conjunction with the Doctor Who brand team. “When we set out to make this game, we had a very clear, very personal vision of what a Doctor Who game should be and this is what we delivered at launch of the game,” said Lee Cummings, Creative Director of Tiny Rebel Games. “But what we didn’t expect is the amazingly supportive and engaged community of players that has emerged from it – the vision for the game has evolved to become what our players want a Doctor Who game to be and it continues to evolve and grow thanks to their enthusiasm and involvement. We consider ourselves the caretakers of the game.” Doctor Who: Legacy is currently available on Google Play, iTunes, Amazon Appstore and on Facebook. Doctor Who: Legacy is the critically acclaimed puzzle RPG launched in late 2013. Join the Doctors from throughout the 51-year history of the show, as well as your favorite allies, and see how you match up against the Doctors’ most formidable foes. Keep up to date with Legacy on Facebook and Twitter. And get the latest news on Doctor Who on the official website, Facebook and Twitter.